How did I become addicted to plastic? There was a time, when I lived in my first apartment, where I could fit everything I owned into the back of a pick-up truck. Consequently, the amount of garbage I created in a week, would not fill a full-sized trash bag. There was little recycling in those days, but even so the amount of plastic in my life was not as ubiquitous as it is today. That was the fall of 1988. Between then and now, how did I become addicted to plastic? Is it just me? The article goes on to highlight that it was not until 1997 that the ‘Great Pacific Garbage Patch’ was first discovered by sailor and researcher Charles Moore. I faintly remember that piece of news on the wire. But, I was 27 years old and couldn’t really care too much about a gyre of mainly plastic garbage, way off in the ocean. Then I grew up and took my kids to Kuta beach in Bali. I did not like what we saw. Not only is the beach chocked with plastic waste, but there is an oily, brown film in the water which sticks to your skin and needs to be washed off with soap. 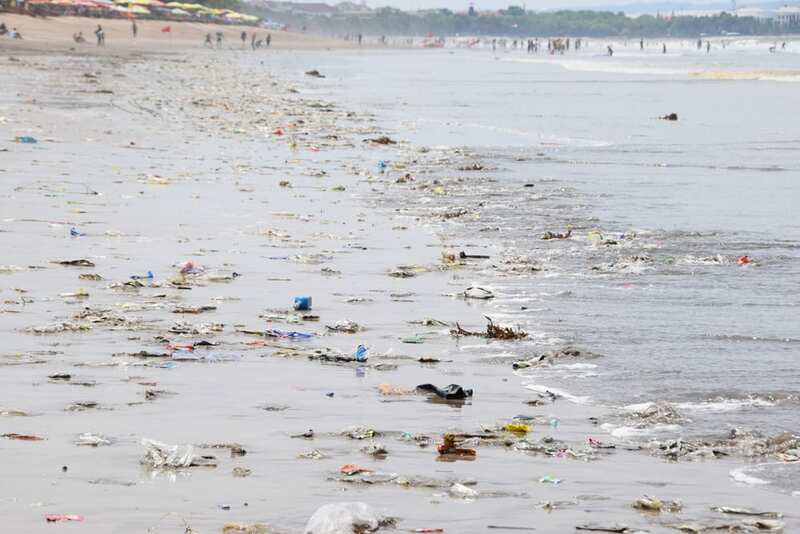 OK, but we are far away from the plastic bags and straws on the beaches of Bali. And we will be heading home soon. I will likely not return to Bali, so this problem should not be my concern. Except it is. Because plastic does not break down, no matter where we put it. And estimates indicate that as of 2011, the world consumes 1 million plastic shopping bags every minute. Considering there are no mass recycling programs for these bags with current technology, we all need to contribute to the solution. Seems simple enough. Stop using and consuming plastic bags in the grocery shopping process. Many cities and even entire countries have instituted bans on plastic shopping bags. But what about all the consumer packaging which uses a thin plastic film? What about all the plastic bags we buy for all kinds of other household use? We are literally drowning the life of the ocean in mostly non-recyclable plastic. In these questions and concerns, I see a huge opportunity. It starts with the zero-waste movement. Ironically, this idea took root in the early 1970’s, at the same time plastic shopping bags were gaining traction. The shopping bag turned into an everyday item due to its convenience and super low-cost. In contrast, a zero waste product or lifestyle requires many moving parts, from product design to consumer acceptance. Everybody has a role to play in moving away from the plastic addiction. It won’t be easy, either. For our household, I am giddy at the thought of restocking our home with all the essential supplies and doing so with a new set of values and habits. It is a challenge to plan for eliminating non-recyclable plastic from our household waste stream, let alone actually finding retail partners. For some reason Canada seems slow to change, possibly because consumers are not demanding it. Luckily in the greater Vancouver area there are 3 retail stores which allow consumers to bring in their own containers from home, assess the tare weight and then fill with whatever the chosen product is. To my mind, this is the future. We will be going back to what retailing used to be like, a century ago. The general store was a place where every bit of packaging was reused and there was not a spot of consumer packaging in sight. I for one, think the return to this kind of shopping experience is overdue. It will not be without challenges, however. Admitting there is a problem, even with the overwhelming evidence, is the first issue. Many people will feel like this is not their battle to fight. Yet, I don’t think anyone can disagree that the experience of having your own containers filled with products of personal choice is really cool. This unlabeled pantry of glass containers is far more pleasing to look at! And then knowing that your efforts are removing loads of plastic from the waste stream is hugely satisfying. I distinctly remember the huge number of plastic bags and styrofoam containers which accumulated at our house. Because these items were not allowed into our municipal recycling system, we found an alternate location to dispose of them. Evidently, that company was baling the plastic and sending it to China for recycling. However, that option has now closed, as reported in April of 2018, ‘China refuses to recycle more of the world’s trash.’ North America has to figure out what to do with all the materials they once sent to China for recycling. My answer to this problem is to create a zero-waste shopping set-up. Stay tuned. I will have video tutorials and shopping trips, as well as loads of written content to guide us through this new process. It is a big change, but it will be worth it. P.S. – recycling is near the bottom of the waste hierarchy anyway.